Roth contributions are not deductible. The advantage to this is that you can withdraw your contributions at any time, for any reason, and no taxes or penalties apply. With this kind of liquidity, a Roth IRA can double as your emergency fund. Before you plan on using your Roth for this purpose, keep in mind that the definition of "contributions" does not include amounts converted to a Roth nor does it include investment gains. For example, if you put $5,500 in and it grew to $6,000, you could withdraw the $5,500 of contributions without taxes or penalties, but taxes and penalties may apply if you withdrew the $500 of gain. If you make too much money you can't contribute to a Roth IRA, or can you? Some people who have all their other retirement money inside qualified retirement accounts can make a non-deductible IRA contribution each year and then convert that to a Roth, thus annually funding their Roth IRA. This is sometimes called a "backdoor Roth." The key to making this work without paying extra taxes is making sure you don't have other IRA accounts. In some cases, you can even roll a self-directed IRA back into a company plan so that in future years you could use the back door Roth strategy without having to pay tax on the converted amount. Many employer plans allow you to make after-tax contributions. At retirement, these after-tax contributions can be rolled directly into a Roth IRA. Any investment gain on the after-tax contributions can't go into the Roth, but the amounts you contributed can. If your employer plan offers this feature, then you can accumulate after-tax savings and later use it to fund a future Roth IRA. This is advantageous in retirement as Roth IRA withdrawals are not taxable and do not impact other items on your tax return the way traditional IRA withdrawals do. One great thing about Roth IRAs is that unlike traditional IRAs there is not an age where you must begin taking money out. This means there is no delayed tax bomb waiting for you with a Roth. Your non-spouse heirs, however, will have to take required distributions from the Roth, but those distributions will be tax-free to them. As long as your adjusted gross income is below the Roth IRA contribution limit then you can contribute to a Roth IRA as well as to a SIMPLE IRA, maximize what you are saving for retirement. The contributions to the SIMPLE will be deductible and the contributions to the Roth will not. This dual funding strategy gives you the ability to reduce taxable income now and have some funds in the Roth accumulate for tax-free benefits in retirement. This could be advantageous for someone who is self-employed and trying to save as much as possible for the future. 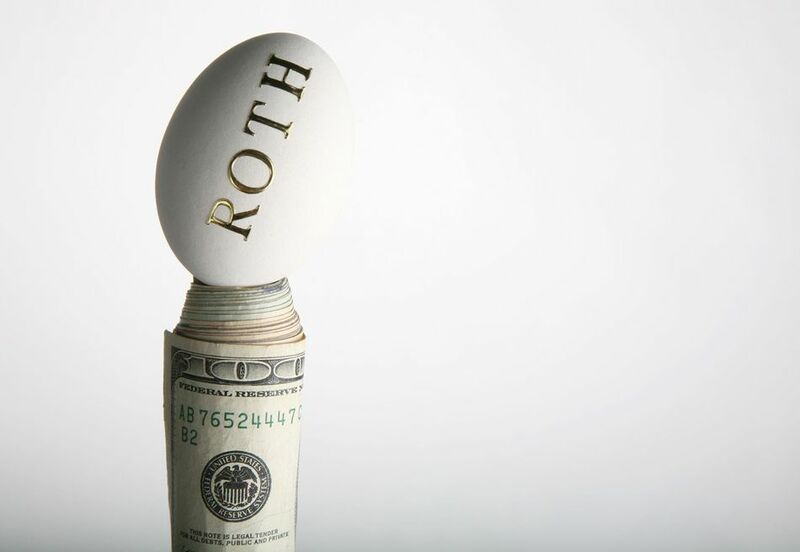 Many 401(k) plans offer the ability to make Roth contributions. This is called a "designated Roth account." Check with your employer to see if their plan provides you with the ability to choose which type of contribution you want to make. With some plans it has to be all Roth or all tax-deductible; other plans allow you to do some of each. If your employer plan doesn't currently allow Roth contributions request that they add it next time they amend their plan. Conventional wisdom says the younger you are, the more time you have for money to grow tax-free inside a Roth. It's true, more time makes Roths better, but age is not the primary factor to use in determining whether to fund an IRA or a Roth IRA. The primary factor to use is your tax bracket; both your marginal tax rate now, and your expected marginal rate in retirement. If your expected tax rate in retirement is likely to be lower than your tax rate now, the deductible contributions may be better. If your tax rate in retirement is likely to be the same or higher in retirement (which is often the case for those who have large 401(k) or IRA accounts) than Roths may make a lot of sense for you. Even if your spouse has no earned income as long as you have earned an income you can make an IRA contribution on their behalf. This is called a spousal IRA contribution. Many couples can double their tax-favored retirement account savings by taking advantage of this. Ask your accountant or financial advisor if your financials are such that you are eligible to make a spousal Roth contribution. If you are eligible for the Roth but think you don't have the cash to make a contribution these last-minute IRA funding tips might have some creative ideas. You can convert traditional IRA or 401(k) money to a Roth. Many online calculators project the results of such a transaction to help you see if it might make sense for you - however, there are many things these online Roth conversion calculators miss. For example, they don't factor in the impact of future required IRA withdrawals and how that impacts the taxation of your Social Security. A Roth can help reduce the impact of this. When you factor everything in, in many cases Roth conversions can be more advantageous than online calculators may lead you to believe.